Price Drop! Was: $139.95 Now: $79.96. For a limited time only, while stocks last. 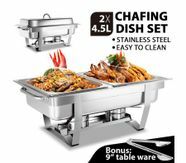 Use this 9L Bain Marie Stainless Steel Food Warmer Cheap Chafing Dish with Food Tong 4.5L*2 Food Pans to serve warm and delicious meals to your guests! This bain marie is capable to keep your food warm by burning chafing fuel so no need to worry about your energy bill. This food warmer has two 4.5L removable food pans to hold different food at the same time. 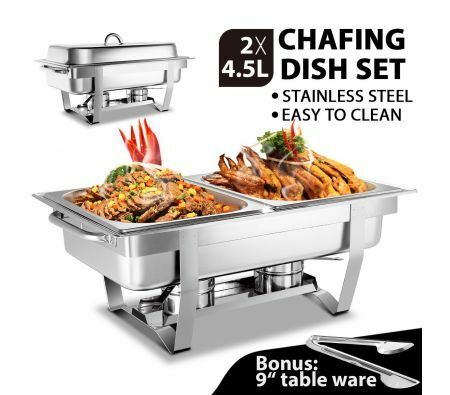 Then, you can steadily transport this chafing dish from kitchen to serving table with the handles on both sides. With the full stainless steel construction, this buffet warmer is robust, rust-free and easy to clean. The food pan, water pan and cover are all electrolysis-finished to perfectly meet all food and hygiene requirements. Come and purchase this cheap catering equipment which is very suitable for buffet, hotel, party and more. You can get a food tong as bonus and we will get it safely delivered to you with the enhanced packaging. 64cm x 36cm x 32cm approx.